Sandardní pružina ventilu pro osazení hlavy motoru 1ks. In many cases, the valve springs only optical views and good appearance reassembled, so this is not the right method. Valve springs for a 1200 cc engine, with 32.0 mm impressions indicate a pressure between 45.6 and 52.4 kg. In 1300-1500 and 1600 cc engines you need them31.0 mmPress the pressure gauge between the 53.2 and 61.2 kgshould indicate. 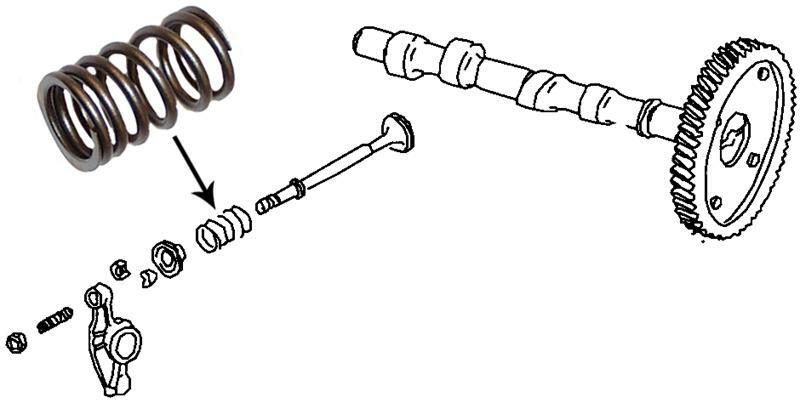 If the valve spring is not within tolerance, you will have to replace him. Valve Springs for the 1200 cc engines are not new in stock, but you can easily fit this standard springs (the pressure is slightly higher but can not hurt, but not for the 25 and 30 hp engines).